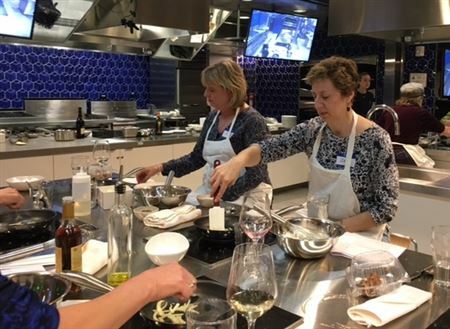 Join us for a variety of hands-on, private classes and then enjoy eating the food that is prepared. Costs, dates, and times vary. Bread baking at the French Corner Bakery in Durham on a Saturday afternoon. A gourmet meal at Durham Spirits Co. Pasta making at Melina's Fresh Pasta. A three-course Italian dinner at Capri Flavors in Research Triangle Park. And the piece de resistance, a repeat performance at the Chef's Kitchen in the Brodhead Center (formerly West Union) on Duke's campus. See the picture below.